Sometimes, you just need a prophecy – even if it comes with the last breaths of a dying seer. The Devourer-From-Within hides in the shadows. It’s face is the face of death, as it molds men and spirits into minions with maniacal glee. Madness is upon it, and a black hand is about it’s throat. 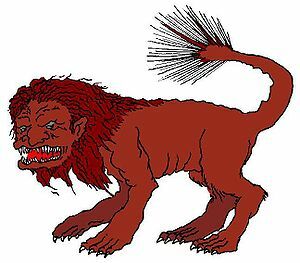 It’s sign is the rune of the Manticore, a monstrous blending of man and beast. Beware! Even if bent to your will, it’s potency comes with immortal danger. It has come from the west, and rests hidden as it gathers strength. From the south comes magic long dead and never dying. Bloodfire and Hellfire twine together in ancient rite, waking cruel and evil gods. The screams of the skinless rise unending – assailing the feathered serpent in his haven. The cycles of sacrifice have begun, the smoking mirror begins his return. His sigil is that of the cat which plays with it’s prey, in pain he rejoices. That which was shall be again. In the east rises the Starchilde’, the Dragon-Maker who brings the sun upon the earth… His eyes are upon the dawn, but the darkness coils within the earth, and prepares for war. Beware! The rising darkness accepts naught but submission, and the heart of light is as pure and terrible as a drawn sword. Neither is kind to the shadows, or to those who walk the hidden ways. The Huntsman, dark and ancient, walks the earth. He is come again upon my people from the north – pursuing his enemy of old and his ancient purpose. Thwarted once, he has become obsessed across the ages. It is the time of the convergence – and the Huntsman will confront at last his ancient enemy. Upon him I dare look no more, his power is great, and he knows that of my people too well.